Clusters of sweetly scented, velvety red and white striped blooms and attractive, deep green foliage make this climbing rose a standout. 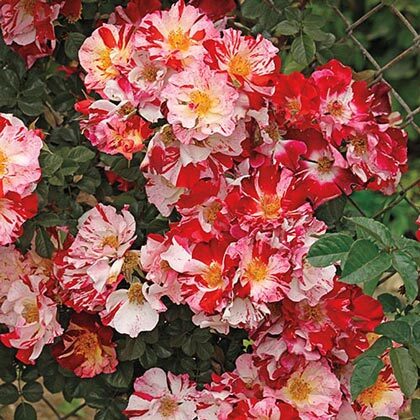 An All-America Rose Selection Winner, Fourth of July Climbing Rose produces profuse clusters of flowers and exhibits excellent disease resistance. Climbing roses, like the Fourth of July Rose, are treasured for their ability to cover horizontal and vertical surfaces in the garden and landscape. Hardy and floriferous, climbing roses bloom throughout the summer months. 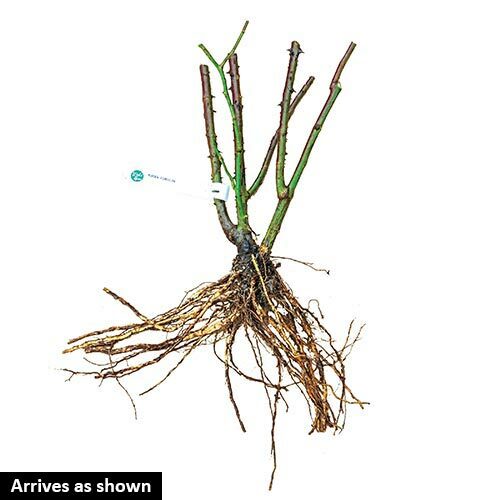 Grows 10-14 ft. tall with a 6-8 ft. spread. Plant in well-drained, humus-enriched soil in full sun to partial shade. U.S. Patent No. 11518. Zones 4-10. Flower FormLarge, semi-double in clusters, 10-15 petals count, light, crushed apple fragrance. ColorVelvety-red striped with bright white. Growth RateSlow the first few months while establishing, moderate thereafter. PruningRemove spent flowers, weak and dead stems, Cut back stems in early spring when buds have broken. CommentsA spectacular rose and the first Climber to win the coveted AARS award in 23 years!! Well named, as the large red and white blossoms appear to explode from buds into into open flowers and continue to do so all season long. It even flowers well the first year which is unusual for a rose and the color is always consistent. Large sprays of flowers are long lasting and a single stem makes a full bouquet in a vase. Superb vigor, good hardiness and sparkling foliage complete the assets of this all round winner. DepthDig a hole large enough to spread out roots without bending them. Firm well and water in thoroughly.